On Saturday, June 23, at 1:30 pm, the 105-year-old former Canadian Pacific Great Lakes passenger liner s.s. Keewatin arrived back at Port McNicoll, her home port between 1912 and 1965, for the first time since she was towed away to Douglas, Michigan, for use as a floating maritime museum in 1967. Today, The Cruise Examiner publishes a photo essay taken during the last leg of her voyage from Mackinaw City to Port McNicoll. She sailed into Port McNicoll on a glorious summer Saturday, welcomed by a fleet of a thousand small craft. The Cruise Examiner was invited onto the last leg and has recorded parts of the voyage for the future, especially two clips of the ship under way once more after not having moved for forty-five years. Although Canadian Pacific ships have not cruised the Great Lakes since 1965, there has been a recent revival in this destination and New York-based Travel Dynamics International still has some space available for 2012 on their 2,557-ton US-flag m.v. Yorktown. 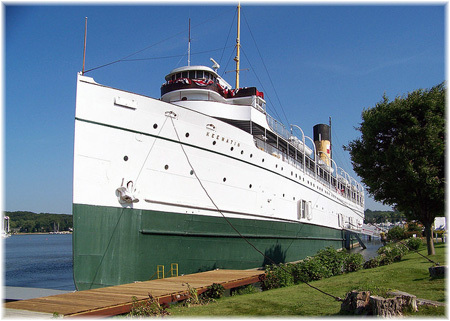 A personal note from The Cruise Examiner: I have a particular interest in the s.s. Keewatin as I was privileged at the age of 17 to land my first real job – as a waiter – on board her sister ship s.s. Assiniboia. This was during their last summer of passenger service and just before I entered university. The Keewatin and Assiniboia were built on the Clyde in 1907 and operated Canadian Pacific’s Great Lakes Steamship Service, sailing weekly from Port McNicoll, on Georgian Bay, to Sault Ste Marie and on to the Canadian Lakehead at Port Arthur and Fort William (which combined into Thunder Bay in 1970). The jackets were blue serge with brass buttons and were quite warm on a hot summer’s day at lunchtime! The Keewatin sailed on Wednesdays and the Assiniboia on Saturdays and the two ships met at Sault Ste Marie every Sunday. The cost of such an “Inland Sea” cruise in those days was $90 per person in an inside cabin or $100 in an outside, and the fare included passage Port McNicoll-Fort William and return, berth and meals aboard ship and hotel room and meals in Fort William while the ship handled cargo. These cruises, which were offered twice weekly, thus consisted of five nights, one of which was spent ashore. The next season, with the passenger service gone (although the Assiniboia still carried cargo for a while), I was given a ticket on “The Canadian” and assigned to Canadian Pacific’s British Columbia Coast Steamship Service, where I joined Princess Patricia, cruising from Vancouver to Alaska. She was built in the same shipyard as Assiniboia and Keewatin and gave her name to Princess Cruises when she was chartered to Stan McDonald of Seattle for two winters cruising from Los Angeles to Mexico. We had to remove all the Mexican decorations in preparation for her next Alaska season. One difference on the West Coast was that the waiters wore cooler white jackets for lunch. Having sailed as a four-year-old from Liverpool to Montreal in Canadian Pacific’s second Empress of Canada, and later worked for the company in Montreal, I had not only immigrated to Canada with them, but had also managed to collect three employee numbers – in Port McNicoll, Vancouver and Montreal! I was privileged to be one of only a few that were invited to join the final leg of the tow of Canadian Pacific’s last surviving passenger ship, s.s. Keewatin, from Mackinaw City back to her home port of Port McNicoll, where she arrived at 1:30 pm on June 23, a hundred years to the day after her first passenger departure from the then-new port, which opened in 1912. Under the auspices of Skyline International Development Inc of Toronto, the Keewatin will become the centrepiece of a new waterfront park in the newly-revived resort community of Port McNicoll. Leaving Mackinaw City on June 19, this is a record of the voyage. 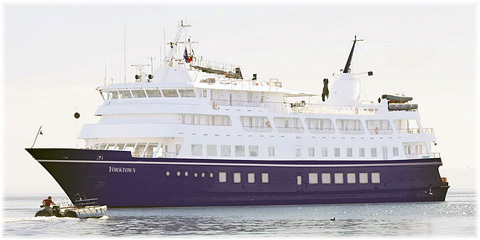 The Keewatin and her sister ship Assinboia stopped cruising the Great Lakes in 1965, but forty-seven years later there has been a revival in cruising the Great Lakes and New York-based Travel Dynamics International still have space on the following departures this summer on their 138-berth m.v. Yorktown. Chicago to Quebec via the St Lawrence Seaway, with fares starting at $3,995 per person (not including $500 per person booking incentive). August 8 – 18 and August 18 – 25, 2012. Detroit to Quebec via the St Lawrence Seaway, with fares starting at $3,995 per person (not including $500 per person booking incentive). August 25 – September 1, 2012.